New from REV'IT! for Fall 2016 are the second generation Dominator 2 GTX Pants. Sticking with the features that made the original Dominator Pants a multi-season champion, yet adding the versatility and all weather properties of the Dominator GTX Jacket make this new generation Dominator Pant the complete weather conquering riding package. The new REV'IT! Dominator 2 GTX Pants feature a 3L GORE-TEX membrane, long and short connection zippers, grip panels at the seat, and laminated reflection panels at the calves and upper legs. What’s new is the unique VCS | aquadefence system. These new ventilation panels provide a cool breeze when opened up, but create a fully waterproof outer shell when closed. Also new for the Dominator 2 is the innovative FidLock magnetic fastener system which offers excellent on-demand ventilation and can be closed with one hand while riding due to the FidLock magnetic fastener. The FidLock magnetic fastener not only uses the attraction but also the repulsion of magnets. 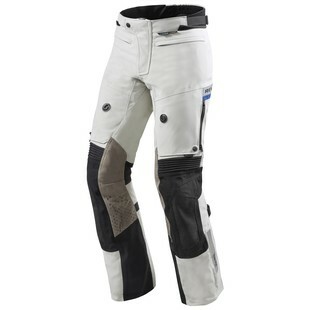 Whether you're looking for a pant to get you through that year round commute or need a pant that can tackle the varying weather conditions on your next moto adventure, the REV'IT! Dominator 2 GTX Pants have everything you need to keep you dry, comfortable, and safe.